I have been reading about your great friend Louie this evening. He sure reminded me of a cook I met on my rounds with my jeep. It was out on the flat area along QL 1. 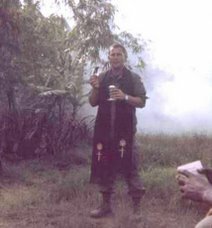 To the best of my memory, there was another chaplain there. They called the cook "the Budda". We had a great time, telling stories. Some time later I was out on one of the firebases on the way to the Ashau on a remote firebase, accessible only by helicopter.. The Brigade Commander was on the fire base and he wanted to see me. There had been a terrible accident on a nearby firebase, and he had me taken in his helicopter to the fire base. They took me to the sight of the accident, a helicopter pad that had a Loch sitting on it. When the Loch had landed, and was still running, the cook had tried to pass under the boom between the engine and the tail rotor. He had bent over to go under the boom and got too close to the rotor. It took the top of his head off. The body was laying on the ground propped up against some sand bags, wrapped up in ponchos. I told the guys to "give me his forehead" and they unwrapped the poncho, so I could anoint him. It may not have been Louie, but somehow I feel it was. Whether it was an accident, or on purpose, no one on this side can know. It was pretty crowded behind the helicopter with the spinning tail rotor. I'd like to think he thought he could get through that space between the exhaust and the tail rotor. Father, it was Buddha. He was quite the individual. My thinking is probably that it had more to do with his alcohism than anything. Buddha was increasingly drinking more and more. He was actually assigned to A Battery which was attached to the Infantry Battalion (not sure where this is old info or not). He was the mess sergeant and was the best at it. But, by the end of the day, often he would be so drunk that he was beyond functioning. I can't remember how much detail I put in the book about him but I, along with several others, had to rescue him often. His getting killed was because he was so drunk that he walked into the rotary blade of the LOH (light observation helicopter). What your comments make me realize: you should write your own memoir. 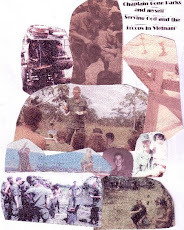 This is a good story and informs those who might like to know more about our sorry Vietnam war. (You did your duty). This story could be topped off by the fact we reported him as KILLED BY ENEMY FIRE!